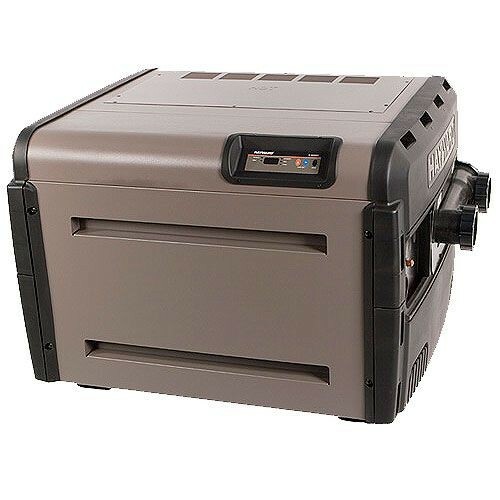 Get the most from your swimming season with the 400,000 BTU Low NOx Propane Heater from Hayward. Now you can swim longer into the evening hours, earlier in the spring and later in the fall. Forced draft system constantly moves air through the combustion chamber at a precise flow rate. Designed with 2" x 2 1/2" CPVC unions. The Universal H-Series Low NOx Propane heater, is environmentally friendly and complies with all current air quality emission standards. The Hayward Universal Series features stainless steel burners, corrosion-resistant heat exchangers and insulated combustion chambers. This traps the heat unlike other forms of insulation delivering the highest degree of performance from every BTU. Equipped with an LED control panel, it monitors heater performance for added convenience and maximum comfort with minimum effort. The ignition system delivers dependable lighting and reliable operations with just a touch of a button. This low NOx emissions heater is perfect for you and the environment all at the same time.